Time to learn homesteading for beginners. Want to know how to homestead? 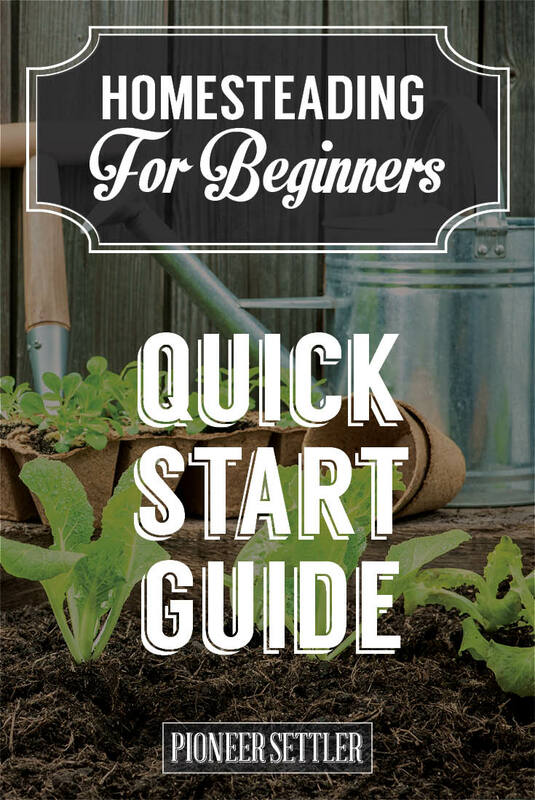 If you want to know how to start homesteading, keep reading for our homestead quick-start guide! If you’ve come to the decision that you want to transition your life and lifestyle to a homestead, I would first of all like to congratulate you. You have taken the first essential step towards an amazingly rewarding life for yourself and your family, and yet another towards the fruitful and healthful practice of raising your own food and becoming more self sufficient. By self-sufficient, I don’t even mean going off grid: you don’t have to bore a well and install solar power, though if you can, that’s awesome. What I am talking about is reducing your reliance on the grocery store, knowing what’s in your food, and all round just feeding your family more healthfully. Teaching a child to provide for themselves is a lesson in independence and responsibility – and everyone knows that digging int he dirt is good for you! So many people have concerns about the physical and ethical treatment of food animals within the commercial system that the allure of raising your own or buying local is growing consistently. There are farmers markets in just about every town, and locally grown meat – be it beef, pork, lamb or chicken – from small farms is ever easier to source. Towns and cities across the US are having their ordinances banning backyard chickens challenged, as people embrace the trend towards home grown eggs. Remember there’s no rules about what constitutes a homestead; anyone who is taking charge of their food sources and providing for themselves qualifies in my book; whether on a quarter of an acre or on a hundred acres! Just bear in mind: chickens are often heralded as ‘the gateway drug’ to homesteading, and there’s a huge truth to that! Dual purpose stock is the homesteader’s best friend, such as this churro sheep will provide wool, meat and milk. As a seller of both meat and dairy animals, increasingly I see people questioning the nutritive value of the milk they are buying from the store, and questioning the sources of allergies and intolerances. Often in their journey from cow milk through soy, almond and rice milk, they eventually stumble upon raw goat milk. Genuine, farm-raised raw goat milk is the best tasting milk in the world, and it’s but a small step for those able to do so to decide to keep a small milk goat in their yard. Then, like the potato chip analogy, you can’t just have one. And that’s how it begins. A flock of sheep, such as these Jacobs, will provide plentiful wool and meat. Ultimately, if you enjoy your homestead and are successful in your growing farm, you might even be able to offer a few animals for sale, or set up a table at a market for fresh vegetables or eggs. Selling your produce is a great way to offset some of your feed or medical costs, and quality, appropriately priced stock is always going to sell well, whether as breeding animals or as cull / freezer fillers. Homesteading is hard work, requires a strong constitution and often means giving up vacations and out of town trips, but I promise you, you’re going to have the best time of your life! The first and most important thing you need to do, before you even think about going any further, is to identify exactly what you want from your homestead. Do you plan to go ‘full service’, raising meat, dairy and vegetables, or some other combination? This is often dictated by the property you are using: are you staying where you are, or buying a new piece of land? If you are staying where you are, assess your property carefully. Don’t overlook cats in your plan, they keep barns rodent free. I have had the frustrating experience of trying desperately to shove a square peg into a round hole on a thoroughly inappropriate property and, while it was only for a year while we found our dream farm, it was a tough year. Be realistic about your property and its capacity. For example, I was living deep in the dense woods, with no pasture, surrounded by mountain laurel, trying to maintain and grow my dairy goat herd. Falling trees and branches were constantly destroying my fences, goats were escaping and getting into the mountain laurel, and my feed and hay bills were outrageous. It was a challenging year for everyone. If you plan to move to a new property, decide what you want first, and then search for a property that suits you needs. This is a long term decision, so don’t rush it. It’s hard, but think with your head instead of your heart. It’s easy to fall in love with a house or property, and think you’ll make some imperfection “work”, but you’ve got a lot of hard work ahead of you, so don’t make it harder. Location (especially relating to agriculturally zoned land and surrounding residentally zone properties), expenses relating to a variety of issues from property taxes to work needing to be done on the house to make it reasonably habitable – these all need to be taken into consideration. As a real life example, when we bought our property, we instantly fell in love with the acreage, the pasture and the barn. We paid very little attention to the house, apart from the fact that it was standing, had a roof and was in dire need of a really, really good clean. We figured we could live with the fact that one of the two bathrooms was unusable, the windows were all single paned, and there was no heat or air. None of this seemed like a big issue in the first flush of true love, but I can tell you, that was a miserable first winter. There was ice on the insides of the windows, and at night we all huddled in the one small room that we could afford to heat with an electric space heater. And I had a six month old… not the best fun I’ve ever had. The second winter we could afford to install a wood stove, and all that is now a distant memory. I offer it up as a learning experience! The temptation to be like a kid in a candy store is enormous, but it’s also very easy to become overwhelmed, especially if yo are new to raising animals. Each type and breed is rife with its own set of issues, and it’s really best to get a good hold of one before you move on to the next. Lots of the things you learn will be transferable, so don’t be discouraged. I began initially with chickens; learning about the power of predators, good nutrition, and parasites. I also started with a small 12×6′ garden, and I now plant 2500sqft each year. If you are venturing into a specific breed of livestock, be it goats, sheep or cows, a mentor who is familiar with that breed and their foibles – some may have specific nutritional requirements or parasite vulnerabilities, or you may need to be making educated decisions regarding breeding choices – and having someone to turn to is invaluable. Join a group, even if it’s just on Facebook. You’re going to have a million questions, and the support of a non-judgmental group (they are out there, find one!) will make any problems you have so much easier. You’ll also learn time saving shortcuts, and medical knowledge that you can use to avoid calling the vet out for every minor ailment. Before you acquire any kind of livestock, find a local vet who treats them, and register. The first time you need a vet will be at 9pm on a Saturday night, or on Labor Day, and vets often won’t do emergency calls for non-clients. You’re never more certain to encounter the circle of life than on a homestead. Deaths, whether it be to illness, old age or accidents, will happen. If you have young children who have never experienced this, decide in advance how you plan to handle it. It can be hard to think straight in the heat and sadness of the moment and little ones are sure to have questions. Good fences make for happy homesteaders. My fence of choice is hog wire with barbed wire, with a combination of T-posts and wooden posts. Both in terms of keep what’s yours in, and what’s not yours out. Stray dogs are destructive predators, and will take any kind of livestock out, from a chicken to a goat, to a calf. And if they can’t take them down, they’ll run them til they drop. So make sure BEFORE you acquire stock that your fences are watertight. As the old saying goes, fences should be horse high, hog tight and bull strong. Personally, I find my larger animals (horses and alpacas) way easier to keep contained than my Nigerian Dwarf goats. Using barbed wire top and bottom deters both jumping and digging, from the inside or the outside! Where there are animals there will be predators. Llamas make good guard animals. Whether it’s a possum after your birds, or a coyote pack stalking your lambs, you’re going to need to address the issue. Fences, unless they are electrified effectively, aren’t going to keep coyotes out, so you might want to consider a Livestock Guardian of some kind. Donkey, llamas and dogs are often used to keep predators at bay. A Livestock Guardian Dog such as this Anatolian x Great Pyrenees will keep unwanted predators at bay. We used to have a stray dog and coyote problem, but she addressed it pretty quickly! Bounty from the homestead: canned jellies and hot sauce, squash from the garden and fresh eggs and milk. 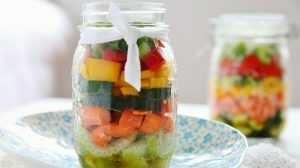 Life will be super busy during spring, summer and fall as you plant, tend, harvest and milk, but during the down months of winter, you’ll be super happy you preserved, canned and froze. Home canned goods are summer in a jar. Click here to learn more about canning. There’s an aspect of homesteading that means that you’re always looking ahead to tomorrow: breeding need to take place so that kidding / lambing / calving takes place at the appropriate time, eggs must be collected to be hatched in 21 days, seeds are planted to germinate and grow when conditions are optimal… bear this in mind always. But never, ever forget to enjoy today. What do you think of these homesteading tips? Let us know in the comments section what your thoughts are on this guide on how to start homesteading. Will you give it a try? Let us know how it went and share your experience with us in the comment section below. Me encantó. Es información muy valiosa y que agradecemos de todo corazón.